On of the classic character from The X Files is one that has the bad habit of smoking and this t-shirt shows that smoking man. 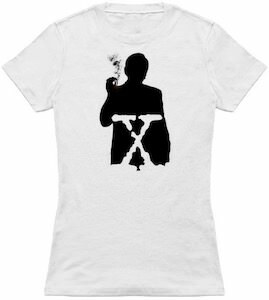 On the t-shirt, you can see the black silhouette of the Smoking man and in his body there you find the famous X from The X Files logo. You can get this special X Files t-shirt in men and women’s styles and in a range of colors and in sizes Small – 6XL. Show the world that you can turn into a silhouette when you keep smoking by wearing this The X Files Smoking Man t-shirt. If you are a big fan of The X Files then you should check out this amazing looking t-shirt. This t-shirt comes in a men and women’s version in sizes Small – 6XL and on the shirt you can see the big X from the logo of The X Files and around the X much more is happening. On the bottom you can see Mulder and Scully and there is an alien and even a UFO on it to making this just an amazing looking shirt. 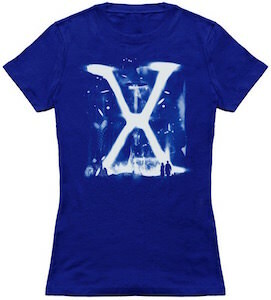 If royal blue is not you color then you are in luck as you can get this The X Files also in black and navy blue. If you watched a lot of episodes of The X Files then you know all about the Smoking Man that always seems to be smoking a cigarette. 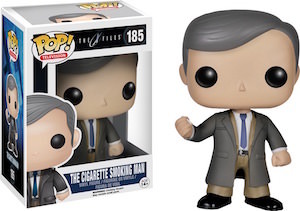 Now you can own a small version of this famous X Files character as they make the Smoking Man into a Pop! Vinyl figurine and he is number 185 in the Funko series. The Smoking man is about 3 3/4 inch tall and of course has a cigarette in his hand because he really is addicted to those things. If you are getting The X Files characters together then this figurine of the cigarette smoking man just has to be part of it. 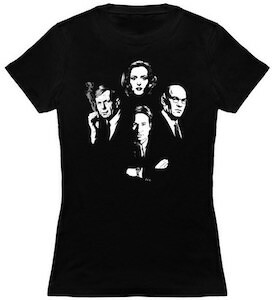 This t-shirt shows 4 of the characters of The X Files and that makes this a great shirt for all the true fans. On this black t-shirt you can see 4 portraits of main characters of the hit TV series and yes that does include Fox Mulder, Dana Scully, Walter Skinner and even The Smoking Man. These 4 are not often seen in the same place at once and that makes this X Files t-shirt so much more special. You can get this t-shirt in men and women’s styles and it is made from 100% cotton and only available in the color black. You can get this The X Files t-shirt in sizes Small – 6XL for the perfect fit for your body. 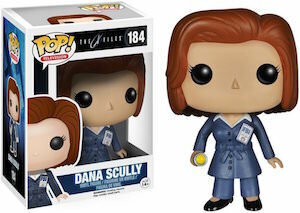 Now you can have your own Dana Scully figurine. The FBI agent from The X Files is ready to keep your secure and far away from paranormal activities. Dana looks just like you expect from her with her hair, suit and even the FBI id card. Scully comes in a windowed box so that she can always look as new but of course you can take her out to so that she can look stunning with your complete The X Files collection. This The X Files figurine is number 184 in the POP! series from Funko and like all the others it’s great fun to collect. Now you can take a nap under this blanket from The X Files and dream away to all those adventures agents Mulder and Scully had. 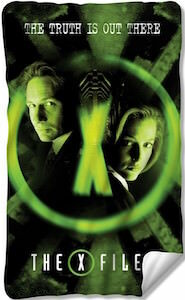 This black blanket shows in neon green a big X in the middle and closet to it images of Fox Mulder and Dana Scully and on the bottom the blanket shows the logo of The X Files and on the top it says “The Truth Is Out There”. This fleece blanket is 60 x 36 inch making it perfect for a picnic in the park or just a nap on the couch. A throw blanket from The X Files is what you really need when you are watching the FBI trying to solve paranormal activity. Now you can own your own little FBI agent that can look into all the paranormal activities around you. This Pop! Vinyl figurine is of Fox Mulder and he of course is from The X Files. 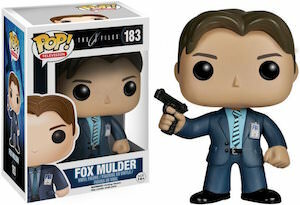 Fox Mulder is number 183 in the figurine series and he looks just like you expect from an FBI agent a nice suit, badge and gun. The figurine of Mulder is 3 3/4 inch tall and comes in his own protective box that is windowed so that he can look out for suspicious things. True fans of The X Files of course are going to want their own version of Mulder and this is where you can get him. Relive the memories of The X-Files television show. 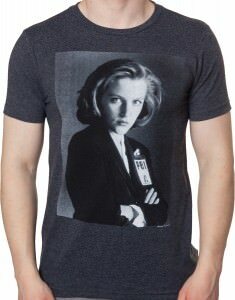 What better way then to showcase this Agent Scully t-shirt. There is one and only Agent Scully and this is her time to shine. This black and white graphic is spectacular! Scully is in a business suit and is showcasing her FBI badge. She is standing sideways, looking at you with her arms crossed and has a serious expression. This t-shirt comes in sizes Small to 3XL and is made from a cotton blend that is sure to make you feel oh so good. It comes in a charcoal grey color and is a men’s fit. Don’t worry ladies, you can still wear this great t-shirt too. Don’t cross your arms in this Cross Armed Scully X-Files T-Shirt. 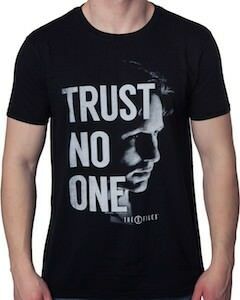 This black t-shirt shows FBI agent Fox Mulder and on top of that the worlds “Trust No One”. Of course fans of the supernatural know that this shirt is from the hit TV series The X Files and it would be great to have a t-shirt like this as it is a classic. This X Files t-shirt is made from 100% preshrunk cotton and comes in sizes Small – 3XL. When Mulder is on your side you never know what is gone happen and that will make life even more excising. 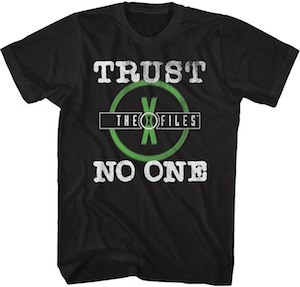 Get ready to remind the world about the X Files by wearing this The X Files Mulder Trust No One T-Shirt.